Relatively favorable thrombophlebitis may overnight become dangerous to the patient's life. Much depends on the localization of thrombophlebitis, but in any case, timely treatment should be performed. It is conducted by a phlebologist or, at worst, by a surgeon. Thrombophlebitis (TF) develops on the background of a previously formed blood clot in the presence of inflammation or damage to the venous vessel. Many congenital conditions can predispose patients to the appearance of thrombophlebitis, especially in the presence of various forms of hypercoagulopathy. Traumatic factors can also trigger the onset of thrombophlebitis. In addition, the maintenance of a significant reflux in a venous vessel that has been treated with a sclerosing substance can lead to phlebitis. 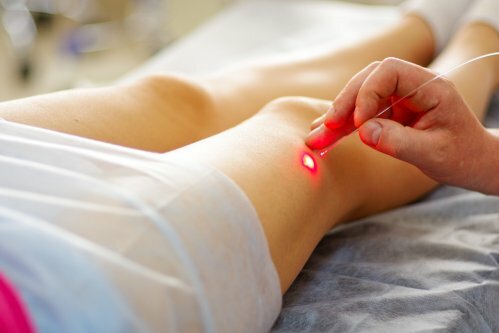 Most often, this pathology occurs if the damaged veins in the area of sclerotherapy are not diagnosed and can not be treated. Thrombophlebitis is a circulatory disorder in which blood passes through the veins not as fast as it is needed. This occurs when a clot of blood (thrombus) slows blood flow through the vessel - most often in the legs, but it also happens in the hands, and in some cases thrombophlebitis develops directly under the skin or has a deeper layout. "Thrombo" means clot, and "phlebitis" is an inflammation in a venous vessel. Most often such a pathological condition occurs after an injury. In most cases thrombophlebitis shallow veins pass independently, in a week or two. In rare cases, these blocked veins become the cause of infection in the site of impaired circulation. In severe cases, necrosis of tissues occurs. Phlebitis of deep veins is called thrombophlebitis of deep veins (or DVT, deep vein thrombosis). It affects the veins, which are deeper in the arms and legs. The formed blood clots can break down and embolize, and then move along the bloodstream to the lungs. This is a potentially life-threatening condition called pulmonary embolism. The average age of Europeans with venous thromboembolism, in more than 15,000 patients, was 66.3 ± 16.9 years. Surface phlebitis is usually caused by local damage to the vessel. On the hands, this can happen as a result of using a catheter placed in a vein whose walls begin to irritate and inflamerate. Also, festering wounds on the hands may become a source of infection, which during its spread affects the vessels, causing their inflammation. On the lower extremities, the surface phlebitis is often associated with varicose veins. Disorders of the blood coagulation system, which are often hereditary. Clinical manifestations of thrombophlebitis depend on the type of pathology and volume of damage to the venous system. Usually there is a slow reddening of the skin around the surface veins. A long, thin red track can be immediately noticed, as most inflammation follows the path of the superficial vein. Sometimes phlebitis takes a spider-like appearance, especially if smaller vessels are involved in the pathological process. The area of damage can be felt as firm, warm and extremely sensitive. Often, the skin around the vein itches and swells. In the place of inflammation, pulsation and temperature increase are often felt. Symptoms may be aggravated if the limb is omitted, especially when it comes to getting out of bed in the morning for the first time. Some patients develop a feverish condition. If, besides thrombophlebitis, an infectious process develops, then redness, fever, pain, swelling or other changes in the skin can appear. painful sensations in the affected limb. It is often seen visually that one limb has larger dimensions than another. Sometimes the coloration of the skin acquires a bluish tinge. When do you need immediate medical assistance? If you have swelling or pain in your limbs, do not delay your visit to a doctor. This is especially true if there are risk factors for deep vein thrombophlebitis, including long-term relocation, bed rest or recent surgery. Pain in the chest and shortness of breath, which may be symptoms of pulmonary embolism. The initial assessment of the affected hand or leg begins at the time of physical examination by the patient's physician.The diagnosis of superficial phlebitis is often done clinically, and further tests are not required. If there are concerns about deep vein thrombosis, then laboratory and instrumental studies may be required. Determination of D-dimer . It is a chemical that is released by blood clots when they begin to decompose. If this blood test is normal, there is no thrombus formation. Unfortunately, the test is not able to indicate where exactly the thrombus is located. For example, it will be positive for people with bruises and those who have recently undergone surgery. This blood test is done only if there is a low risk of the presence of DVT. A positive test must be complemented by an instrumental study of a possible affected area. Ultrasound diagnosis . It may help to locate blood clots or sites of blocked blood flow, especially in large and proximal venous vessels. The test is non-invasive and is rapidly carried out; it is also considered relatively painless. Venography. If the ultrasound was insufficient, a contrast agent was introduced near the lesion site, after which the photos are taken with the help of radiography and the condition of the vessels is evaluated. Computer tomography. In some cases it is complemented by angiography, which allows you to establish more accurate blood flow characteristics and size of the affected area. It is considered to be a relatively harmless method, although it is rather costly. To the affected area you need to apply a warm compress. With the consent of the doctor, suitable medications can be taken: (ibuprofen, anti-inflammatory medicine, painkiller or local antibacterial agent). In the event of foot injury, compression stockings are often used to improve blood flow and can help relieve pain and swelling and reduce the risk of developing thyroid gland. If the diagnosis is deep vein thrombophlebitis, anticoagulants are required to prevent pulmonary embolism. These drugs can be taken only by the appointment of a physician, since in case of overdose, severe bleeding is possible. Initial treatment can be started with enoxaparin (Lovenox), an injectable drug that immediately dilutes the blood. Also, warfarin (Coumadin) can be used, which starts to act immediately, but it takes several days to reach therapeutic concentration in the blood. For this reason, Lovenox is used as an intermediate therapy, while warfarin is "gaining momentum." Additionally, a blood test is given, which helps to evaluate the function of blood coagulation. Used as a guide for determining the dosage of warfarin. All these methods are used after the elimination of acute symptoms of thrombophlebitis and are usually directed to the treatment of large venous vessels. Video: Thrombophlebitis, treatment. How to treat thrombophlebitis. Checked out! Surface thrombophlebitis rarely causes serious complications, and usually after the treatment, relief of pain, fever and inflammation are usually quickly eliminated. Despite the favorable flow, in the absence of adequate treatment, superficial TF can affect deeper vessels, which ultimately often complicates pulmonary embolism. Deep vein thromboembolism is potentially life-threatening if it is not treated and its most frequent complication is pulmonary embolism. Therefore, it is important to find out the causes of TBV and minimize the risk factors for a possible recurrence of the disease. TBV can cause damage to the internal structure of the veins, which ultimately leads to complications such as posttrombophlebitis with chronic swelling and pain. Video: PROFILATICS OF EDUCATION OF PIPES: what you need to know! Thrombophlebitis, superficial or deep, must be treated with appropriate methods. This will eliminate the clinical signs that often violate the normal life of a person. In some cases, treatment is carried out promptly, which makes it possible to avoid dysfunctional consequences. The veins may become inflamed and clogged with blood clots. If the vessels involved in the pathological process, closely passing along the surface of the skin, then speak of superficial thrombophlebitis. According to its clinical signs and site of defeat it can be different, but most often in the pathological process involves the vessels of the legs, which leads to thrombophlebitis of the lower extremities. Chronic venous insufficiency in the absence of treatment may be complicated by thrombophlebitis of the lower extremities or other organs and systems of the body. It is impossible to ignore this disease, as it is often expressed in pain and other discomfortable symptoms. The therapy is conducted taking into account the location of the lesion and the severity of the condition.